CAMPBELL, Calif.--(BUSINESS WIRE)--Market research firm Infonetics Research released excerpts from its new Business Cloud VoIP and UC Services market size and forecasts report, which tracks hosted PBX and unified communications (UC) revenue and seats. “While sales of premises-based PBX systems have been stagnant to declining over the past few years, the market for cloud services continues to expand with businesses worldwide seeking out hosted alternatives,” notes Diane Myers, principal analyst for VoIP, UC, and IMS at Infonetics Research. Infonetics’ annual business cloud VoIP and UC services report provides worldwide and regional market size, forecasts through 2018, analysis, and trends for hosted PBX (IP Centrex and hosted VoIP/IP PBX services) and unified communications telephony and applications revenue, seats, and ARPU. The report includes a Hosted PBX/UC Tracker highlighting deployments by region, service provider, and vendor platform. Service providers in the report include 8X8, AT&T, Avaya, BT, CenturyLink, Charter, Comcast, Cox, IntelePeer, Korea Telecom, Masergy, Mitel, Orange, RingCentral, Samsung Networks, ShoreTel, Sprint, Star2Star, TDS, Telecom Argentina, Telenor, Telstra, Telus, Verizon, Vodafone, Vonage, Windstream, XO, and many others. To buy the report, contact Infonetics: www.infonetics.com/contact.asp. View more report highlights and Infonetics’ webinar schedule at www.infonetics.com or download Infonetics’ 2014 market research brochure, publication calendar, tables of contents, and more at www.infonetics.com/login. Infonetics Research (www.infonetics.com) is an international market research and consulting firm serving the communications industry since 1990. A leader in defining and tracking emerging and established technologies in all world regions, Infonetics helps clients plan, strategize, and compete effectively. View Infonetics’ About Us slides here. 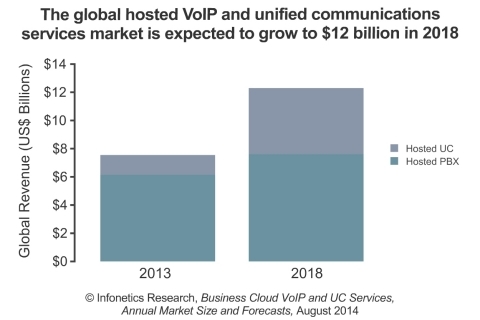 Excerpts from Infonetics Research's 2014 Business Cloud VoIP and UC services market size and forecasts report. Led by analyst Diane Myers.